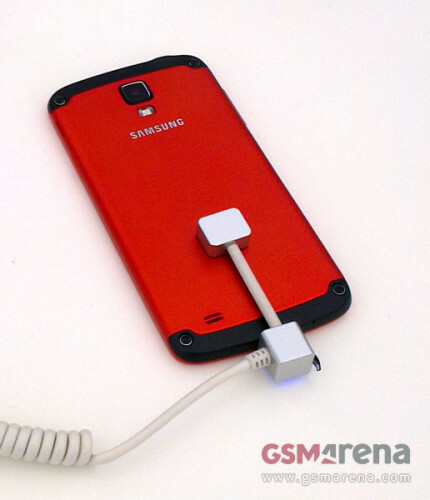 Pictures of the upcoming Samsung Galaxy S4 Active? We have heard quite a few rumors on the Galaxy S4 Active lately. For those who completely missed it, S4 Active is basically a Galaxy S4 which you can drop in all kinds of stuff, like water and in the ground. See more pictures and specs in the full article. The specs are expected to be the same as the regular S4, and the pictures below confirm it. 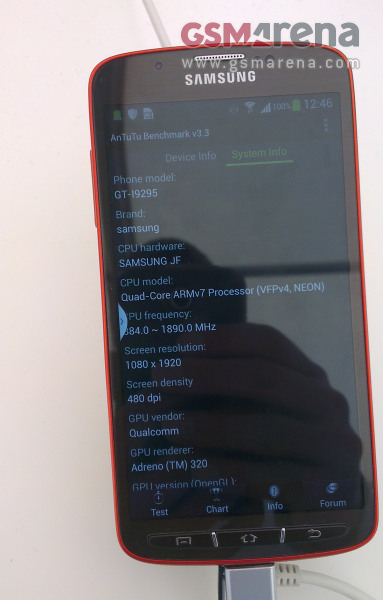 The device is running on a quad-core 1.9GHz processor with Adreno 320 GPU, which most definitely means a Snapdragon 600 chipset. The screen supposedly has the same size and resolution as the original Galaxy S4- a 5.0-inch 1080p unit, though it’s unclear if it’s a Super AMOLED one or not. Strangely enough, the reported pixel density of the phone is 480ppi, so the display might actually be smaller. According to GSMArena, the Samsung Galaxy S4 Active has an 8MP rear camera, which is a less than the 13MP sensor found on the Galaxy S4. Despite the similar specs, the Galaxy S4 Active looks nothing like the original. It comes in a metallic shell with bolts on the back, and there are also three hardware buttons below the screen. There is no official info on the Galaxy S4 Active yet, but as it turns out the handset has been showcased recently in Croatia, so an announcement is imminent.